The skiing world lost a pioneer last week when Robert Earl Smith, founder of Smith Sports Optics based in Ketchum, died of heart failure in California last week at the age of 78. Smith was the inventor of the double-lens ski goggle, an invention that stemmed both from his love of skiing and his technical skill as an orthodontist. The goggles were the first to have thermal lenses and foam venting, which prevented the lenses from fogging up in adverse conditions. "The goggle really just came out of his need to see while skiing deep powder," said son Drew Smith. "Everyone else just got to benefit from it." Smith and his wife, Jean, were living in Alta, Utah, when weather conditions and fogging goggles led the frustrated powder hound to build prototypes around the kitchen table using foam, glue and orthodontist tools. He later built the goggles in his garage and sold them to fellow skiers in Utah, putting the money toward the cost of a lift ticket. The goggles were the first to not only have the double lens and side-vented foam that made the goggles breathable, Drew said, but they were the first to feature foam around the face to make them more comfortable. Drew said his father later shared the patent with other companies in an effort to bring his technology to a wider audience. "He wanted everyone to share in his advancements," Drew said. "The technology allowed other people to do what he did, which was to ski deep powder." When sales took off in the early 1970s, Smith founded Smith Sport Optics and built its headquarters in Ketchum. Drew called his father one of the "ski pioneers" who came to the Wood River Valley. "He wanted to go to a good ski hill, and the conditions brought him there," Drew said. "He came for the powder." The Original goggle was produced after Smith struck a short-term deal with Scott USA in 1971. Smith's company later developed the Turbo Fan Constant Air Management System in 1979 and the Slider 01 in 1995, which was the first dual-lens interchangeable model of sunglasses. Drew said the benefit to the air management system was that a skier could wear glasses under it without the glasses fogging up. "He was very ambitious, a big problem-solver kind of a guy," he said. "He just kept going and kept going." Drew said his father was driven in all aspects of his life, and was constantly reading and learning. 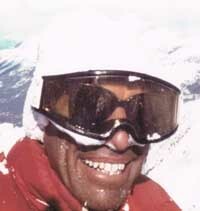 However, despite Smith's innovation in the ski goggle industry, he was sternly practical in most areas of his life. "He didn't like flashy stuff," Drew said. "He used to really resist change except a few new models of goggles and a few colors. That practicality—and making a quality product—made him the best."